It is not uncommon for health care and regular check ups during pregnancy to be deemed unnecessary among underserved communities in Kenya. Thus, when co-designing group antenatal care, there is a critical need to make a clear link between antenatal care and a healthy baby. “The baby is just blood for the first three months. There’s nothing there to take care of,” said one Kenyan father-to-be in Kakamega, Western Kenya, where M4ID conducted research on the possibilities of group antenatal care. In Kenya, the care received from healthcare professionals during pregnancy is often seen as an expensive and unnecessary clinical experience involving a lot of waiting and spending money. However, attending an antenatal care clinic early in the pregnancy is crucial for three reasons: Firstly, to identify and treat pregnancy related complications such as pre-eclampsia and anaemia, which are considerable risk-factors associated with maternal mortality. Secondly, early attendance also lends itself to promoting of skilled attendance at birth, as well as healthy behaviours such as breastfeeding and early postnatal care. Thirdly, regular antenatal care also prevents HIV-positive pregnant women from passing on the virus to their unborn babies. In order to improve the community perception of antenatal care, and to increase the number of women attending the sessions, Management Sciences for Health (MSH) asked M4ID to help customise a group antenatal care model for Kenya using a human-centred design approach. 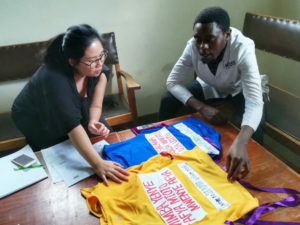 This project, carrying the name Lea Mimba, is an adaptation of a successful model that M4ID helped MSH develop in the Ugandan communities of Mbale and Bududa back in 2016. From the initial desk research and long field visits in the Kakamega county, the M4ID team drew the conclusion that there are several important influencers around the pregnant mother who affect the decision to attend antenatal care. “The attitudes of mother-in-laws, husbands and community health volunteers range all the way from being very positive about antenatal care, to being actively against it. What we discovered that they have in common, though, is the desire for the baby to be healthy,” explains M4ID’s Design Research Lead Priyam Sharda. Thus, it became apparent that there is a critical need to make the link between antenatal care and healthy pregnancy, mother and baby clear to the community surrounding the mother-to-be. 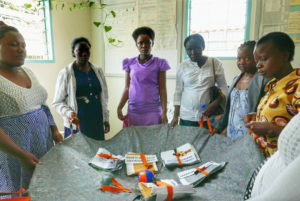 M4ID created cost-effective antenatal care materials that served the dual purpose of being both engagement tools for attending the care, as well as community engagement materials. The materials were designed to create awareness about the progress of pregnancy, and to articulate the care it deserves at each stage, including the early phases. This is important as according to traditional cultural beliefs in Kenya, pregnancy only “starts” towards the end of the second trimester. As a result of the design work, the antenatal care clinic in Kakamega was branded as the “Lea Mimba Club”, meaning “take care of your pregnancy”, in the local language. It offers pregnant women a private, safe space that allows them to participate discreetly. “Privacy was considered important as any public declarations of pregnancy are avoided before the end of the second trimester. This is because of superstitions and cultural traditions,” explains Fang-Yi Lee, Service Designer in the project. An important function of Club Lea Mimba is peer support, that is, mothers learning from one another, as well as from the midwives. 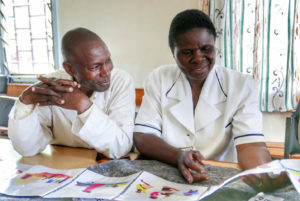 In Kenya, peers are an important early touchpoint for information as authority figures such as doctors are considered difficult to approach. “We incorporated peer support in the antenatal care model by encouraging mothers to take the contact details of each other to meet up before the following session, and by pairing them to do the weight and blood pressure check-ups,” Lee epxlains. Story-telling became an important feature in the model. Personal stories greatly influence the decision to attend antenatal care as women wish to learn from each other’s experiences. Thus, it was recommended that midwives use stories and narratives to bring to life a few of the central messages at all group antenatal care sessions. The use of visuals and spoken communication was also seen as a strategy to address the low literacy levels among the mothers-to-be. This was also preferred by the midwives who felt that they already had a lot of existing printed material. The midwives were also supportive of the decision of the M4ID team to move the antenatal care meetings from the busy mornings to afternoons, when the clinic was not that crowded. Moreover, the group format was seen as saving the scarce time of the midwives, and enabling them to share more advice and information if compared to the previous one-to-one antenatal care meetings. The Kenyan group antenatal care model was finalised in February 2017 together with MSH. M4ID’s service designer Fang-yi Lee testing the concept for community engagement with the local nurse. Kenyan nurses reviewing the visualisations made for the material for group antenatal care. Kakamegan mothers-to-be test the group model for antenatal care. M4ID team introduced some innovative tools to the antenatal care model that serve as job-aids for midwives. -To be sung in the antenatal group sessions as to kick-start each session as well as to help revisit messages at the end of the session. -Signals mother’s upcoming antenatal care appointments, encouraging the rest of the family to offer her support with tasks. -Visuals were adapted to suit the Kenyan context.